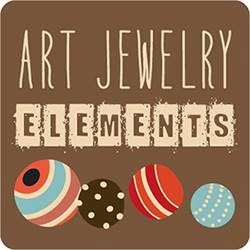 And it's time for another Component of the Month with Art Elements. This month we had a guest contributor - Kristie Roeder of Artisan Clay. Even though I didn't get chosen to use one of the components she gave away, I had one in my stash that I had recently reclaimed from an unsold necklace, so I decided to play along! As usual, I did not take a photo of the piece before I used it. But really, did you expect me to? I really enjoy the zen I get from bead weaving, so I decided that's what I was going to do with this ceramic ring. However, the hole in the middle presented a dilemma to me. I had seen Jennifer Cameron made a piece and filled in the hole with a perfectly sized czech bead; however, I didn't have any. I did, however, have this lucite flower bead, and I used a small czech flower in the middle, and a size 15 cobalt bead to hold it all in place! I have these awesome black necklace blanks so I decided to make the loops to simply string on one of them. I have to get better at my loops - not sure what happened to those skills, they must have left my brain! Please check out what everyone else made with their Kristie Roeder creations! Great job on the necklace and wonderful design! Sp pretty Sue - lovely palette and you're bead choices are perfect. Gorgeous design Sue, the flowers are just perfect! Sue, what a beautiful piece. I love the colors and the flower in the center. I would wear that necklace every day! The beadwork looks terrific. Great idea using the Lucite bead to fill the hole. Sue - its delicious. Sure these ARE some of my personal favorite colors. But still. Gorgeous work! Beautiful bead weaving-your piece is so fresh looking! I love this piece Sue! The colours are just perfect and your bead work looks like lace! Stunning! I love the colors in your piece! The flowers in the center were a smart idea. Finally catching up with all the blog posts... Your piece for this COM is beautiful. Reminds me of the colors of the Caribbean sea. And your bead choice & beading are impeccable!